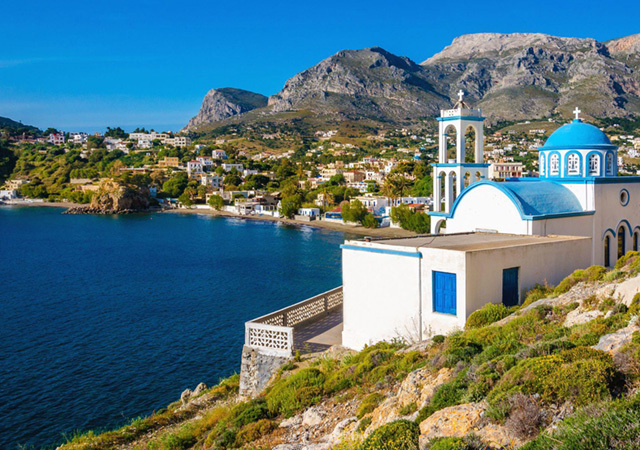 Join artist Annie Herron on a magical 20 days sketching tour of the spectacular Greek islands of Kalymnos (5 nights), Lipsi (6 nights), Patmos (3 nights), Leros (5 nights). Dates: 11th June – 30th June 2020. Land Cost Only 2020: A$4,290 twin share 20 days. – Accommodation in hotels and villas with private facilities and balconies with beautiful vistas. – 4 lunches and 4 dinners with beverages. – Wine and cheese tasting. – Transfer costs to and from the airport on the islands. – Transport by taxi or bus to painting locations. – Ferry and boat transfers to the various islands featured in the itinerary. – Welcome and farewell cocktails. – Flights are not included in the tour cost. You are responsible for booking international return flights to Athens and domestic flights to and from the islands, as stated in the itinerary. Flights may be booked independently through any travel agency or through our own travel agent associated with the tour. Please check for tour confirmation prior to flight payment. The cost of Optional excursions ranges from $35 -$100. No visa is required for Turkey day trip. The painting itinerary may be subject to change depending on weather conditions. If twin share is requested, please note that you are responsible for sharing arrangements. Various artists run different tours. Due to unforeseen circumstances, an artist may need to be substituted in order for the trip to proceed to avoid cancellation and disappointment. In the unlikely event that this happens, you will be offered full refund if you decide to cancel. – Materials. You are required to bring along your own painting materials, including easels and stools if required. Please refer to the material list and make sure you are well equipped for the art tour as it is extremely difficult to buy art materials on these islands. Once your booking is confirmed, the recommended list of materials put together by the tutor of your chosen tour will be sent to you. – Luggage. You are advised to pack lightly as we travel by ferry to the other islands, and you are responsible for managing your luggage. Only minimal clothing is required as Greece is extremely casual, and you can wash and dry overnight. – Banks. A.T.M. outlets are situated on all these islands. Visa and Mastercard are accepted in some shops, but it is basically a cash economy. – EXTRA NIGHTS ACCOMMODATION. If you are extending your accommodation before or after the tour on the islands featured in the itinerary, the required payment for the extra nights can be paid directly to your host when you arrive in Greece. – The painting itinerary may be subject to change depending on weather conditions. – If twin share is requested please note that you are responsible for sharing arrangements. – If the minimum number is not met, the tour may be cancelled with a full refund. – Various artists run different tours. Due to unforeseen circumstances, an artist may need to be substituted in order for the trip to proceed to avoid cancellation and disappointment. In the unlikely event that this happens, you will be offered full refund if you decide to cancel. – To confirm your reservation, a deposit of $500 is required to ensure your place on the tour. Final payment is required 90 days prior tour commencement. – Within 15 days prior tour – total land cost. – Within 30-15 days prior tour – 75% total land cost. – Within 45 – 30 days prior tour – 50% total land cost. – Within 60 – 45 days prior tour – 25% total land cost. – Within 90 – 60 days prior tour – tour deposit. – 90 days or more prior tour – no cancellation fee. Complete the form below to reserve your spot on the Painting In The Greek Isles With Annie Herron 2020. Once you click the ‘Submit Booking’ button, you will be directed to the payment page where you will be required to make the deposit of A$500 to confirm your spot.